This past weekend I was at the Ace Expo, which made its debut in Albuquerque (that's right, I can spell it.) 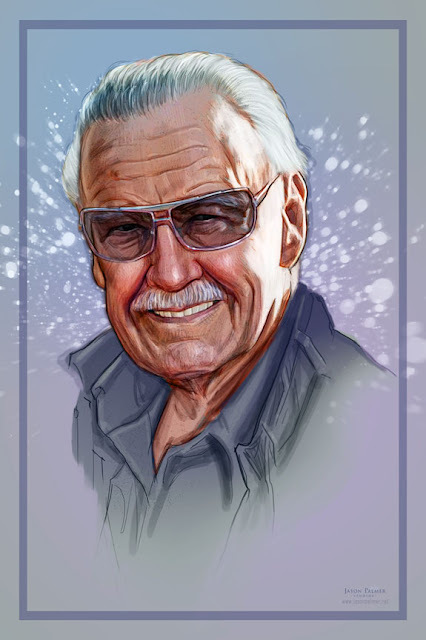 The show organizers asked if I could do something special for the show, so I did a portrait of Stan Lee. They wanted me to present it to him during his panel Sat morning. I was dubious; this could be great or it could be awkward. But I went, waited in the wings and hoped for the best. My friend and Albuquerque resident David (Brohawk) Williams called and said, "I'm on my way, I'm bringing my Spiderman costume. You think I should wear it?" "uh sure" I said. Moderator Lloyd Kaufman, with a fellow dressed as the Toxic Avenger in tow, introduced Stan. 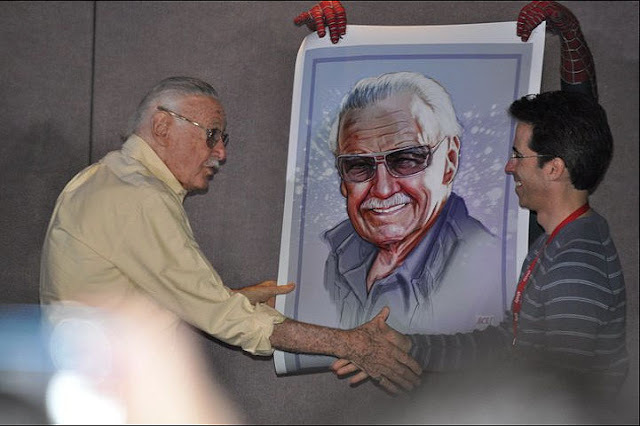 Stan commented to Kaufman "you have Toxey here, but I don't have Spidey!" I called Dave back, "get here as fast as you can!" 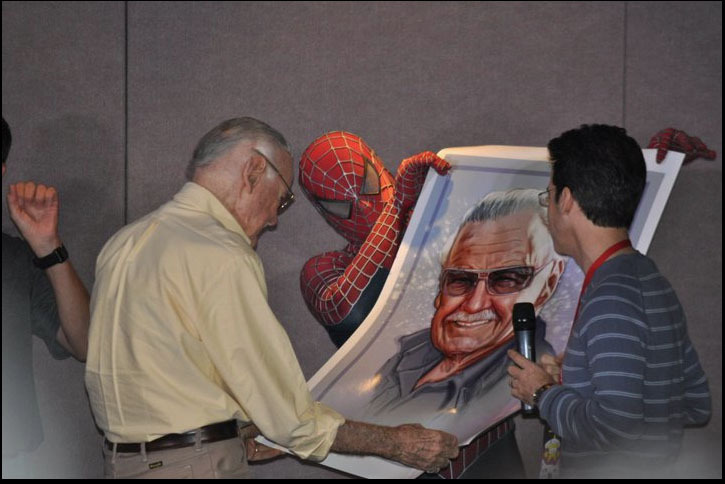 15 minutes later Dave walks in as Spidey just as Stan is talking about the character. "Go, go!" I urged Dave, and up he went, to huge applause, hamming it up. Kaufman then called me up on stage, saying to Stan that I had something for him. "I was wondering when I was going to get an award or something!" Stan said. It all went better than I had hoped. He would have been polite in any case, but seemed to genuinely like it. We got to talk a little the next day, and I'm astounded with the man's vitality, wit and enthusiasm. He's like a human exclamation point! The man will be 90 next year! Great guy, great experience. Thank You Lona J. Pidanick for taking these pics. Looks like it was a good time! 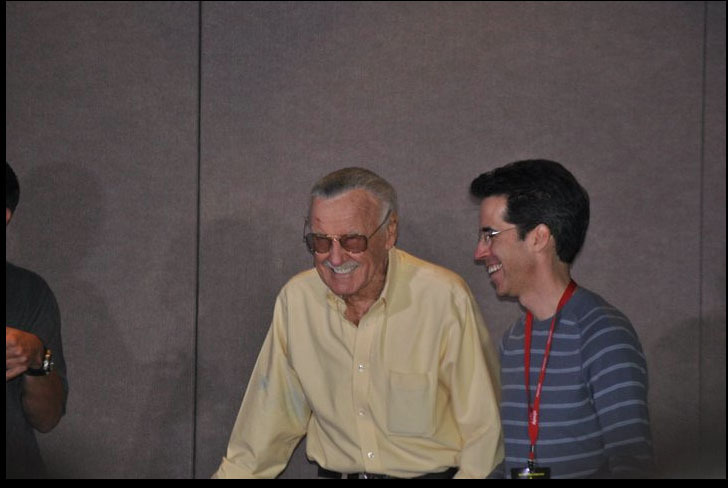 Stan Lee is the man! This is so good. 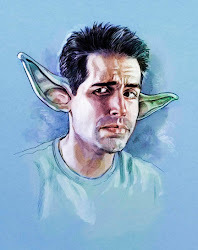 I think it's the best portrait of him I've ever seen.